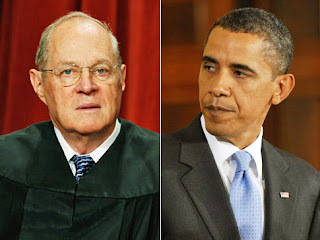 The Urban Politico: As ObamaCare Heads to Supreme Court, We Ask 1 Question: How Will J. Kennedy Feel That Day? As ObamaCare Heads to Supreme Court, We Ask 1 Question: How Will J. Kennedy Feel That Day? Meet Supreme Court Justice Anthony Kennedy. You probably haven't really heard much, if anything, about Justice Kennedy. In fact, if you're like most Americans, you probably don't really know too much about the mysterious Supreme Court itself, who's on it, how many judges are on it, or just what the heck those people actually do anyway. Considering the fact that only 1% of all Americans can actually name all 9 current members of the Court, it would not surprise us in the least if your natural reaction to the first line of this post is "Justice Who?" Just who is this Justice Kennedy cat anyway, and why should we care? Well, for starters, you can see all of his basic biographical info HERE, but that's not why we care. No, the real reason why legal nerds like myself even bother to commit this cat's name to memory is because in a country where we have a blatantly politicized Supreme Court that likes to decide cases down ideological lines instead of actually listening to the merits of each case, this man is the tie breaker. And when the Affordable Care Act ("ObamaCare") makes it's way to the Supreme Court - which may happen as early as January 2012 - you can bet your bottom dollar that whether Obama's signature piece of legislation lives or dies will be determined by this one Supreme Court Justice. As mentioned, there are 9 Justices on the Supreme Court. 4 of them are die hard Progressives (J. Ginsburg, J. Breyer, J. Sotomayor, and J. Kagan). 4 of them are die hard Conservatives (C.J. Roberts, J. Scalia, J. Thomas, J. Alito). And then there's Justice Kennedy, the quote unquote "Swing Voter" who sits in the middle. On some days he votes with the Conservatives, on other days he's with the Progressives. There's a running joke in the legal community about this current Supreme Court that goes something like this: if you want to know how this Court will rule on any given case, just ask Justice Kennedy how he feels that morning. Admittedly it's not a very funny joke but it's actually not far off from the truth. Ever since the Obama Administration turned down its right to appeal a recent federal court decision against ObamaCare, folks have started counting down the days until the final title bout fight that will take place before the Supreme Court. The law has finally worked its way up through the federal trial courts and into the federal circuit courts of appeal ("Circuit Courts"). There are 13 Circuit Courts in the U.S. (see a map of the Circuits HERE), and 3 of them have ruled on ObamaCare. Of those three, two of them (the 6th Circuit and the 4th Circuit) have ruled in favor of the law while one (the 11th Circuit) has ruled against it. This creates what is known as a "Circuit Split." Whenever a Circuit Split exists on a major piece of legislation, it basically guarantees that the Supreme Court will have to consolidate all of the cases and make one ruling that settles the split among the Circuits. Which brings us back to our good friend, Justice Kennedy. So how will he feel that day? Perhaps the best way to figure that out is to look at how Justice Kennedy has ruled on similar issues in the past. The controversial issue with ObamaCare is the individual mandate that requires Americans to either purchase health care or possibly pay some type of fine. Critics say that requiring people to buy health care oversteps Congress' power under the Commerce Clause. Supporters say that the ability to create the mandate is clearly within Congress' power to regulate interstate commerce under the Commerce Clause. We have debated this issue at length on this blog; our own Shady Grady comes down on the side of the critics while I come down on the side of the supporters. But the real question is, which side does Justice Kennedy come down on? Of course we can never say with 100% accuracy which way Justice Kennedy may lean, but when we study the past decisions of Justice Kennedy the evidence tends to suggest that he might actually rule that the Commerce Clause supports the mandate. In U.S. v. Lopez, 514 U.S. 549 (1995), the Supreme Court, for the first time in 60 years, pimp slapped Congress for overstepping its bounds on the Commerce Clause. Although Justice Kennedy joined the majority of the Court that felt Congress had gone too far, he stepped to the side of the majority and wrote his own concurring opinion where he basically said the Founding Fathers intended for Congress to have the ability to regulate more broadly under the Commerce Clause than what the majority in Lopez had allowed. Similarly in Gonzalez v. Raich, 545 U.S. 1 (2005), Justice Kennedy joined the majority in that case which upheld a very progressive view of the Commerce Clause. In that case, the Court held that Congress was well within its rights to use the Commerce Clause to strike down California's medicinal marijuana laws. However, it should be noted that Justice Kennedy is a true conservative in the sense that he doesn't like to stray too far on his decisions. Where other conservative justices may want to overturn Roe v. Wade, Justice Kennedy actually voted to uphold it - not because it fell in line with his ideology, but because the country has grown accustomed to abortion being legal. In other words, he does not like to upset the status quo. With that in mind, most of the previous Commerce Clause cases have involved the regulation of an "activity." Everybody agrees Congress can do this. What people are not so sure about is whether Congress can regulate "inactivity," which is the primary criticism often leveled against the individual mandate. Since this may be seen by Justice Kennedy as something going against the status quo, there is definitely a fair chance that he may rule against ObamaCare. Will Kennedy vote for or against? Should the Supreme Court be deciding this kind of a case? Is our Supreme Court too political? Does Justice Kennedy have too much power?